When Andrew was younger, it became obvious that sitting at the kitchen counter to practice school work or therapy words was not going to be easy or fun, for either of us! That is one of the main reasons for coming up with My Obstacle Course. We needed something different and one of the things that I realized right away was how easy it was to turn basic skills he was working on into easy games or sorts. These sorts also allowed him to show what he knew without needing to be intelligible. I was able to reinforce his teachers and also challenge him where he was academically. Turning something like working on long vowel patterns into a game or a sort like this makes it so much more fun. My Obstacle Course Station Activity: Sort the words according to their vowel pattern. The picture shows this station activity during a March/Spring themed Obstacle Course. Doesn’t it look so much more appealing than the usual ways to practice spelling patterns? I think so, and more importantly, so does Andrew! The task is clear and he knows that once he is done, we get to move on. He’s not going to be stuck there for an unknown amount of time practicing something he may or may not care about. There is a purpose to this, sort the words into the correct pail, which makes motivating him so much easier. I wrote out words that had the long /a/ patterns he was working on (words like pail, rain, lane, gave, day, ray, etc.) on calendar cutouts and also provided cutouts with the vowel patterns on them as labels to show where they go. This could be done with uppercase or lowercase letters for letter recognition, or any vowel/spelling pattern that your child is working on (here is a link to a page of vowel patterns). If you don’t have cutouts or don’t want to use them, any paper, index cards or post-it notes work well. 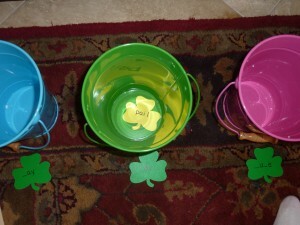 I used some spring colored pails from Target so he would have a place to sort the words into. This also helps me because after he sorts them and before we move on, we go through each pail’s words, read them out loud together and I can double-check to make sure they were all correctly sorted. When they get to the station, point out the vowel pattern labels and say the sound the pattern makes. Flip over the first card in the pile, say the word and find the pattern the word uses. 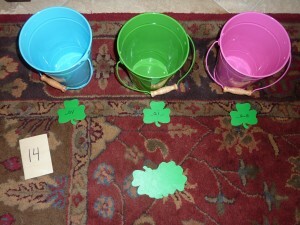 Place the card into the pail that is labeled with the pattern. Continue until all of the words have been sorted. If you’d like to add a challenge, hold the cards, say the word and have them spell it out loud or place it in the correct pail without looking at the word. If they don’t get it correct, put it back in the pile or show it to them, point out the vowel pattern and place it in the correct pail. The word "pail" sorted into the "-ai-" bucket. This activity doesn’t take much time to make or set up at all, just a little planning and prep work. It really is such a simple thing however it is helping your child build academic skills while also allowing you to engage and encourage them in a fun way.